US President George W Bush has vetoed a controversial bill which would have lifted a ban on federal funding for new embryonic stem cell research. It was the first time in his presidency that Mr Bush refused to sign into law a bill approved by Congress. "It crosses a moral boundary that our decent society needs to respect, so I vetoed it," he said on Wednesday. Polls suggest most Americans back the research, which scientists hope will lead to cures for serious illnesses. Supporters of the research say the technique offers hope for people suffering degenerative diseases such as Alzheimer's and Parkinson's, and for diabetes. The House of Representatives later failed to achieve the necessary two-thirds vote needed to overturn Mr Bush's veto. In waiting until the fifth year of his presidency to veto any legislation, Mr Bush became the first president to complete four years in office without a veto since John Quincy Adams in the 1820s. Mr Bush has said he is against the use of public funds for research involving the destruction of human embryos. He has also consistently opposed embryonic research on moral grounds. 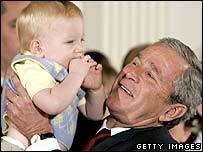 Mr Bush announced his decision at the White House in the company of 18 families whose children were born after using embryos "unwanted" by other couples seeking fertility treatment. "This bill would support the taking of innocent human life of the hope of finding medical benefits for others," the president said. "Each of these children was still adopted while still an embryo and has been blessed with a chance to grow, to grow up in a loving family. These boys and girls are not spare parts." The BBC's James Coomarasamy, in Washington, says that whatever the scientific implications of this action, it will certainly find favour among many of Mr Bush's socially conservative Republican supporters. 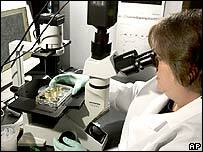 The stem cell debate seems set to be an issue in November's mid-term congressional elections. The Senate vote came at the end of two days of emotional debates on three separate stem cell bills. The vetoed bill, the Stem Cell Research Enhancement Act, would have scrapped limits on federal funding imposed by Mr Bush in 2001. Bill Frist, the Republican leader of the Senate and a supporter of the bill, said he was disappointed by the veto, even though, like the president, he was opposed to abortion. "I am pro-life, but I disagree with the president's decision," he said. "Given the potential of this research and the limitations of the existing lines eligible for federally funded research, I think additional lines should be made available." Democrats who backed the bill wrote thanking Mr Frist for his support on the issue, the AFP agency reported. The 2001 ban provides government money only for so-called lines of stem cells that already existed when the order came into effect, not for any new lines. Mr Bush signed into law another billpassed by both the House and the Senate which bans the growing and aborting of foetuses for research. A second bill that would encourage stem cell research from sources other than embryos was passed by the Senate but not the House. In the years since Mr Bush imposed limits on federal funding, pressure has been building for a loosening of restrictions. Campaigners for stem cell research include prominent Republicans such as Nancy Reagan, whose husband, former President Ronald Reagan, died after a long battle with Alzheimer's.